I realized the other day, when a potential customer contacted me for details about my albums, that I have not done a very good job of explaining what the wedding album is or what the advantages are to protecting your memories in a wedding album. So I thought I would make a list of the advantages to owning a Wedding Album and then show you some pictures so you can see what a wedding album might look like. A wedding album will hold and protect your images for a lifetime. It will keep your wedding images together, making them easier to share. It's better than storing a bunch of 4x6s in a shoebox or a CD on your shelf. The print quality and size of the image can be much better than 5x7" or 8x10" prints. 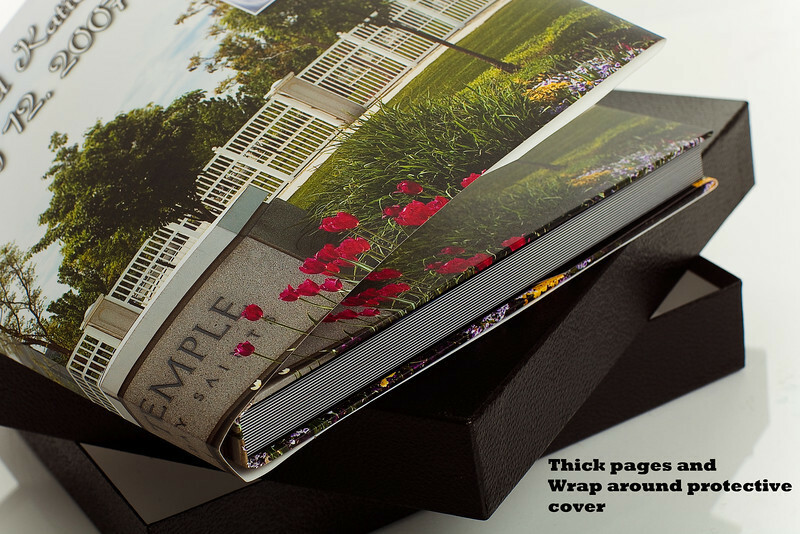 Printed on heavy pages, the images won't tear or wear out. Each album is custom designed, based on your feedback, to feature the images you want to cherish forever. Note that it comes in a heavy protective box for storage on the shelf. 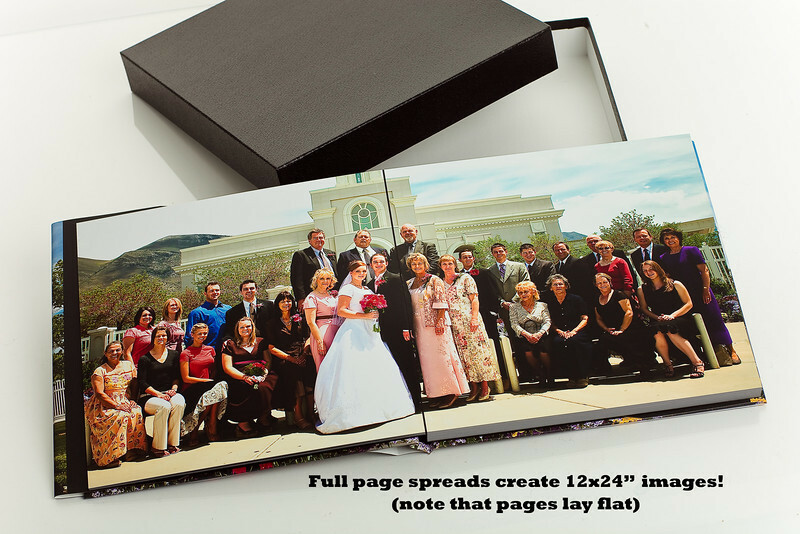 At 12x12" per page, full page spreads become 12x24" images! Note, too, that pages lay completely flat (unlike a traditional book style album which will curl in the middle). This allows you to see the full image without having to bend the book backwards to see into the middle. Each page is thick and heavy. The pages don't bend or tear. And as you turn the page, there is a feeling of quality that you don't get with thin book style pages. The images are printed right on the page, and they go all the way to the edge of the page. 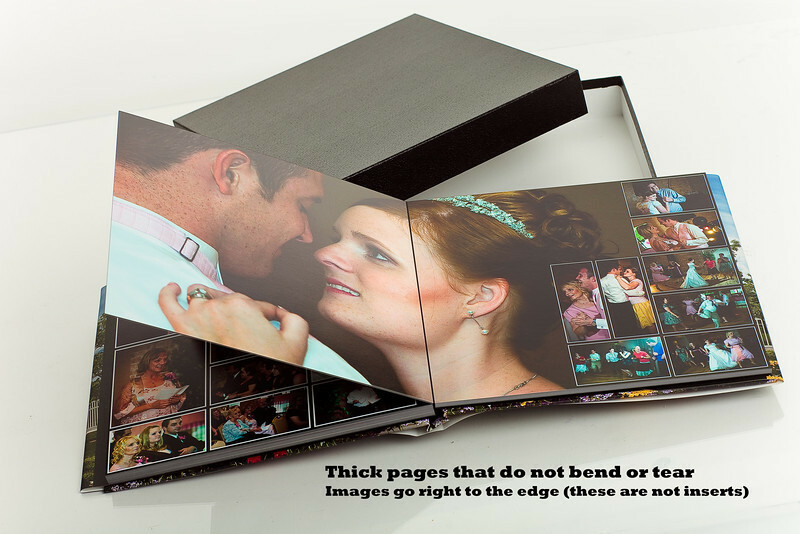 These are not simple "picture inserts" into a pre-made wedding album with cutouts. Each album is custom designed and printed just for you. 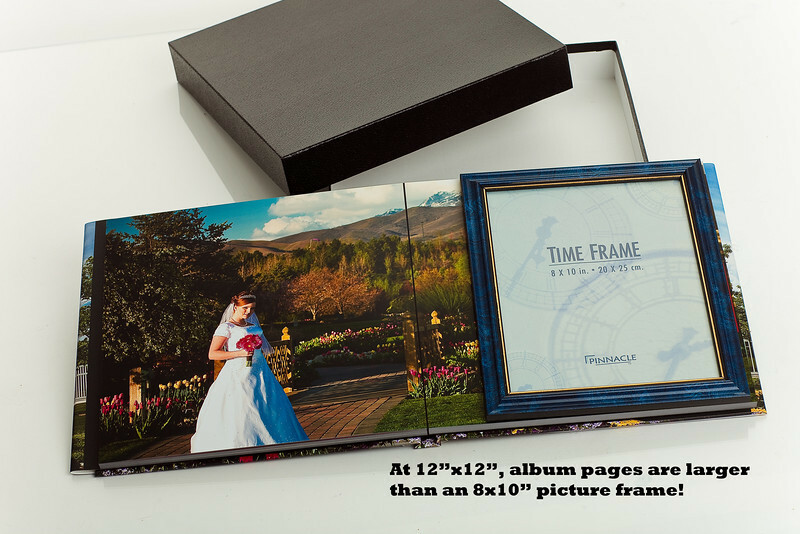 At 12x12", each page of the album is 80% larger than an 8x10" print. If you wanted to make your own album, purchasing 30 8x10" prints would be smaller, would cost $720, and you'd still need to buy an album and put it together yourself. In some ways, the wedding album is a bargain. Each album comes with a 12x24" wrap around cover (right on the album), plus a 12x24" protective cover made of thick material to avoid tearing. This image also gives you some idea as to the thickness of the pages (this being a 30 page album). I hope this gives you a better idea why you would want a wedding album. Please contact me for pricing details and how to go about selecting images for your wedding album. Please consider the ideas presented in the following link when considering whether or not to purchase a wedding album.